Wheelchair Manufacturers – Please contact CEW Sales directly at 1-800-479-4335 to fulfill your production requirements. Our sales and design staff will personally assist you in getting the precise wheel, tire, hand rim, or assembly to meet your needs. Orders may be placed by phone, email, or mail 7:00 am – 4:00 pm CST Monday through Friday. To expedite orders please specify the part number of the item ordered. To avoid duplication please mark all confirming orders. 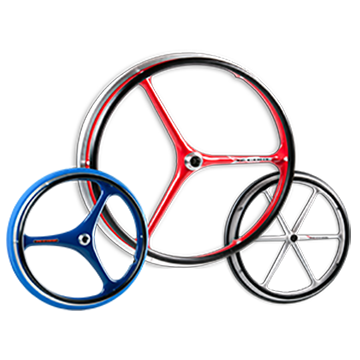 Minimum order quantities are typically 20 units for wheels over 12″ and more for smaller wheels. Our sales department will be available to assist should smaller quantities be needed. Individual Buyers – The best way to get genuine CEW X-Core®, Shox®, or Aeroflex® products is through one of our preferred distributors listed on this page. If you are unsure which distributor to contact, please call CEW at 1-800-479-4335 for assistance.